The Math Window® Large Print Indicator kit is the perfect companion for those using our Large Print kit with Braille users. 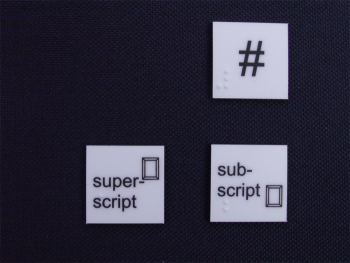 It contains all Braille indicators, terminators, and other tiles required to transform your Large Print kit into a functional tool for Braille users. Each kit includes indicators for numerals, fractions, complex fractions, mixed numbers, superscripts, subscripts, ELI’s, GLI’s and capitalization. Our 1″ tiles, extra thick for ease of manipulation with 75 pt font. Braille in the lower left corner. UEB Indicator Tiles are included in LP Basic and LP Algebra UEB Kits.